Damien Roy, left, and Bailey Roy, seen in this October 2015 police handout photo. The blue 1967 Buick Skylark would have been perfect for an all-American road trip. But Damien Roy, 22, and Bailey Roy, 21, never got that far. Before the two brothers could even cross the Canadian border, drones, helicopters, police dogs and a SWAT team surrounded their car. From 10 a.m. to 10 p.m. on Oct. 26, 2018, the checkpoint between Houlton, Maine, and Woodstock, New Brunswick, remained closed amid a bizarre standoff, frustrating thousands of travelers. In the end, there was no security threat — just two brothers from Halifax, Nova Scotia, with a poorly conceived plan and 21 jugs of gasoline. On Friday, Canadian officials agreed to drop terrorism hoax charges against the Roys and release them from jail, and explained for the first time what had led to their arrest. The men, it turned out, had been trying to see if they could make it to Mexico in a car with no license plates, and without stopping for gas or presenting any identification along the way. “This was more stupid than it was criminal,” Crown prosecutor Brian Munn told the judge, according to the Canadian Broadcasting Corp. The CBC reported that the two brothers remained silent in court as an agreed-upon set of facts was read aloud, detailing how their escapades had landed them in jail. It all started on the day before their arrest, when they bought the vintage Skylark, which had no certificate of registration, legal documents or license plates. For reasons unknown, the brothers decided that they didn’t want to stop at any gas stations until they crossed into Mexico, so they loaded 21 jugs of gasoline in the back seat and trunk, the CBC reported. The antique car wasn’t equipped with a GPS, so they planned their travels on paper maps and threw those into the back as well, along with some food for the 5,000-mile journey. The larger issue, however was that they had no passports or any other form of ID with them. The Roys decided to take a back road through a remote stretch of the North Country where they were unlikely to encounter checkpoints, then sneak into Maine. Their old-school navigation methods evidently failed: At around 10 a.m. on Oct. 26, they found themselves approaching one of the largest checkpoints in New Brunswick, less than 350 miles from home. Bailey had been driving, and Damien sat in the passenger seat. According to the CBC, Munn said they both “froze” when they realized what was happening. The Skylark abruptly came to a stop in the middle of the road. Officials on both sides of the border were unnerved. Lights flashing and sirens blaring, two officers from the Canada Border Services Agency went over to investigate. One tried to ask if they were OK but got no response: The men just stared dead ahead, gazing out over the pine trees and the deep drifts of snow. Then border agents noticed the jugs of gas. They quickly backed away, closed the checkpoint and summoned the Royal Canadian Mounted Police. A chaotic scene ensued. “There were probably 100 plus security personnel, Canadian and U.S., surrounding the vehicle,” John Slipp, who owns a duty-free store near the checkpoint, told CTV News. “There was a helicopter and a SWAT team.” Eventually, Slipp was told to evacuate. Over the next six hours, police dogs sniffed the brothers’ car, a drone circled overhead and police tried in vain to talk to them. Meanwhile, traffic came to a standstill, and disgruntled drivers complained that being redirected to the nearest border crossing, 100 miles south, was going to make their trips hours longer. The silent standoff finally ended around 4:30 p.m., when the Mounties brought in a military-style armored truck. As the intimidating-looking vehicle closed in, Bailey Roy hit the gas. He sped across the border into Maine and came to a stop as the truck rammed into a parked U.S. Customs and Border Protection vehicle, creating a blockade. The two brothers spilled out of the passenger-side door and were immediately taken into custody. Nearly six hours later, the checkpoint reopened. They ended up spending the next four months behind bars. Within 24 hours of his arrest, U.S. officials handed Bailey over to Canadian authorities for prosecution. Damien, who had tried to claim asylum, spent roughly a month in detention before he, too, was sent back to face trial in the Provincial Court of New Brunswick. Both were charged with committing a hoax related to terrorist activity and willfully obstructing peace officers. While neither had a criminal record, it wasn’t their first brush with the law. In 2015, the brothers, then teenagers, were reported missing after they went on a camping trip and failed to return. Their disappearance prompted a massive search-and-rescue operation, but after nearly six weeks, they returned home, completely unscathed. A judge later placed them in an adult diversion program that allowed them to avoid being prosecuted on obstruction charges. At the time, their father, Corey Roy, told the Chronicle Herald that the boys had developed an interest in survivalism and often made extended trips into the woods to practice living in isolation. He said they had no interest in drugs, alcohol and other typical teenage mischief, and adhered to strict diets in which they ate little but raw vegetables and protein. They sold most of their possessions but held onto their car, which they had been using to make “sudden, secret runs” to Montreal, Toronto and Quebec City. Speaking to CTV News in October after his sons were arrested at the border, Roy said that he was just grateful they hadn’t been shot. Damien and Bailey had been getting into trouble since elementary school, when they had to be separated because their teacher couldn’t handle both at once, he said. Both were smart when they wanted to be, he said, and read constantly, preferring each other’s company to being around anyone else. He couldn’t explain what had motivated their bizarre behavior, and added that he wished that he had spent more time monitoring what they were looking at on the internet. On Friday, both brothers declined to discuss their exploits with reporters. During the hearing, Damien raised only one question: What had happened to the Skylark? It was still in Maine, Munn told him, outside the Crown’s jurisdiction. According to the Telegraph-Journal, the prosecutor argued that their stunt had a serious economic impact on both Canada and the United States, since hundreds of commercial trucks typically pass daily through the Houlton-Woodstock checkpoint, at the northern terminus of Interstate 95. But he also acknowledged that the brothers had maintained that their misadventures hadn’t been politically motivated, and that they had no plan to commit an act of terrorism. “To use the words of Bailey Roy himself during an interview, essentially what they had done was ‘stupid,’” he said. 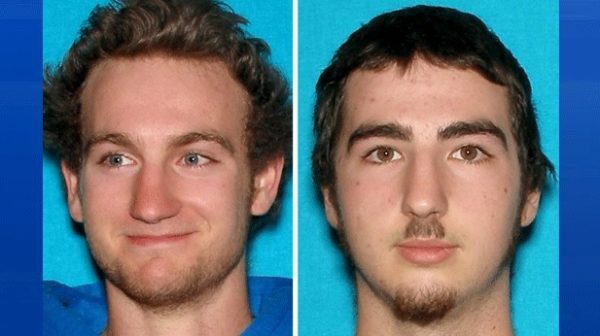 After the terrorism hoax charges were dropped, both brothers pleaded guilty to obstructing law enforcement, and were sentenced to three months in prison with credit for time served, allowing them to walk free that same day. Judge David Walker wished them good luck, the CBC reported. They left the courthouse dressed in the same gym shorts and sneakers that they had been wearing when they set off on their road trip, and began looking for a ride back to their mother’s house.